This weekend was the inaugural flight of my newly completed “Painless Parafoil”. As soon as I unfolded it, it wanted to fly. And it did. What a wonderful feeling when something you’ve worked on for weeks is completed and behaves like it should. It flies! I spent the first flight making changes to the bridle to get the right angle on the kite so it would fly the bet it could. It was more active than I expected. 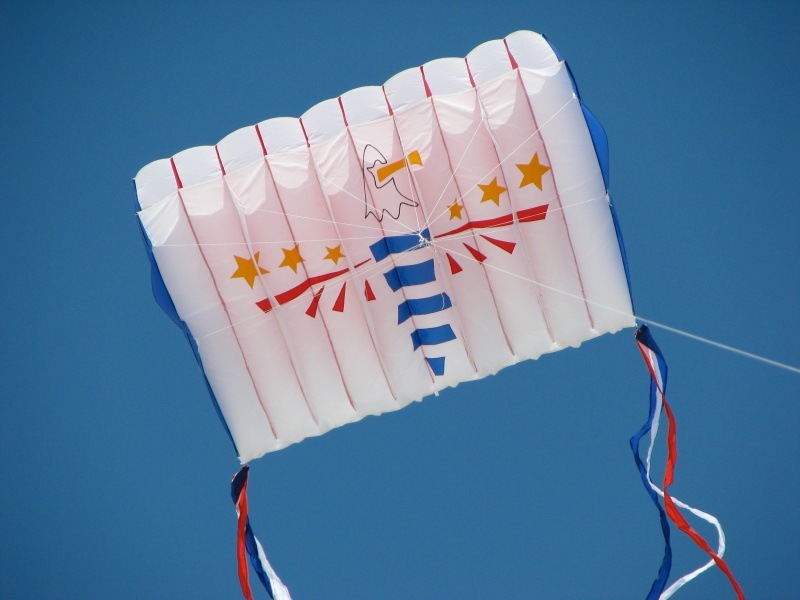 So I borrowed the ribbon tails off my husband’s delta kite and sent it up again. The tails helped a bit. I could see that I would need more that just those short tails to tame this kite. I made a couple of more bridle changes before bringing it down and going home. It was a wonderful first flight. Today was the weekly kite club fly. I got some 24 foot transition tails to put on the Eagle and planned on doing some final tweaking at the fly. The transition tails did help. But it’s still more active than I thought it should be. I’m going to borrow some larger transition tails from my husband and see if the next flight isn’t even better. If so, I may be doing some heavy negotiating about a trade of the smaller tails for the larger. Or I may just not give them back. LOL. The club fly was not well attended today. I got there late. There were a lot of kites up despite the low turnout. After about an hour, everyone left. My kites were the only ones in the sky. After I got the Eagle settled, I added my large mesh delta with its long tails and my small Stowaway parafoil with its long tail. 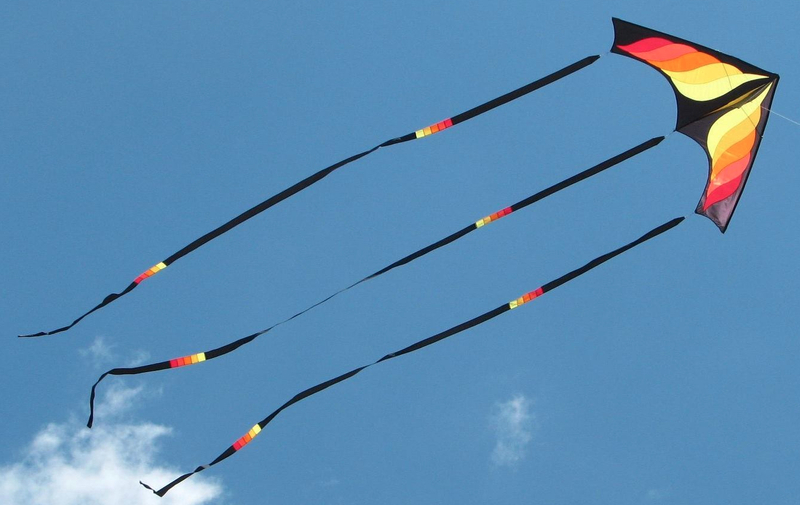 The tails made it seem like there was more in the sky and my kites didn’t look so lost and alone. It was rather strange to be flying by myself. 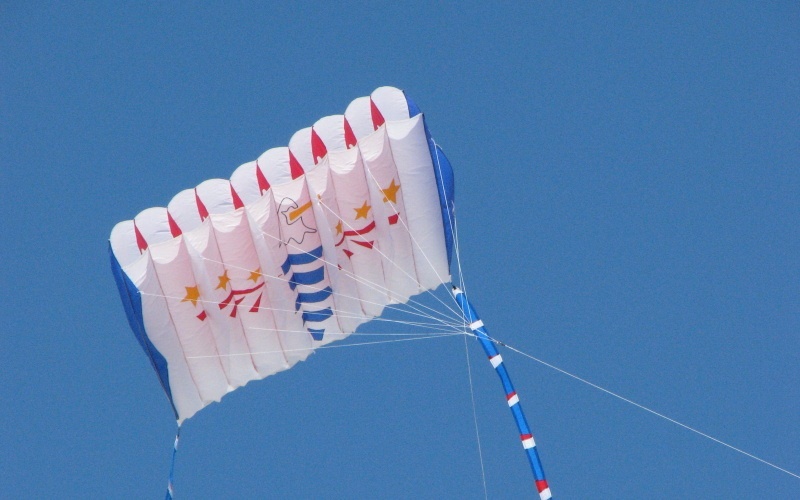 I got out my Symphony soft stunt kite and played with it for a while. I hadn’t flown it in quite a long time so it was fun to play. It looked so colorful against the blue sky that I was wishing I could get a photo of it. 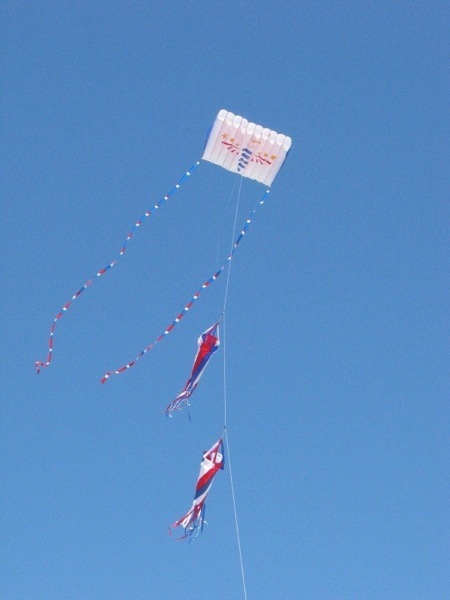 And that made me realize that I didn’t have many photos of any of my stunt kites. It’s just not possible to take a good photo of a stunt kite while you’re flying because your hands are full of either two or four kite lines. I need to arrange for someone to take photos while I fly and just switch from one kite to the next until the entire contents of the kite bag is flown and shot. Let’s see, who can I draft for a project like that? Anyway, to get back on topic, it was so beautiful on the beach today and so peaceful that although I was flying alone, I didn’t feel lonely. It was peaceful and quiet and just a great day to be there. And so I spent almost 2 1/2 hours on the beach with my kites. Until hunger drove me home. It was a great day and now I’m sitting in the backyard listening to the night sounds. Seems like an appropriate ending.